I am now 25.5 weeks through; and boy is this pregnancy going fast! But after reading Helen's update on her pregnancy (she is carrying twins mind you); I have decided I have got NOTHING to complain about, and will only be writing 'flowery sentiments' :-)! Mr.C had me convinced I am MUCH bigger this time - but on putting together a photo comparison, I have decided he is WRONG! The size looks pretty much the same to me, what do you think? I was going to make you guess which is the more recent photo of the three of them, but decided against that... just in case you make a mistake as my hair style is currently very similar! Hmmmm! Both of the two photos of me carrying Button were 'Baby Bump Comparisons' with friends or family who were pregnant at the same time; hence why there were two photos taken of me so close together. 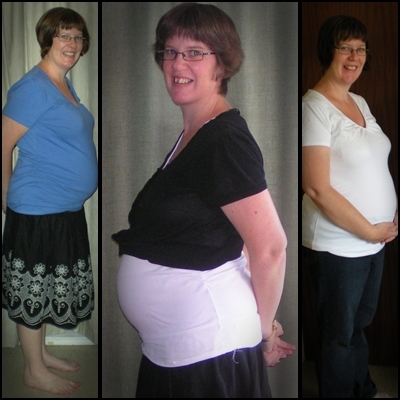 Having just showed Mr.C this collage - he is still convinced I am carrying much bigger, and that the photos are deceiving ;-)! I think he just wants a 'big boy' as he is convinced Asher is going to be an All Black!!!! However, I am starting to notice little things such as bending over Button's cot is causing a few problems with the tummy getting in the way, I am slower getting up and down off the floor with her, I can't bend down without gagging (low blood pressure I guess), and I can't walk as far without getting tired and puffed these days! But these are just normal things which happen once you get bigger and start carrying the extra weight of a second body around! It'll get worse before it gets better ;-)! I remember! This child is MUCH more active than Button was - typical boy! He started at 5:30am this morning when Button first woke up, and pretty much didn't stop until after 10am, thankfully he is now quiet... he also responds when you poke him! Button never did; this can be quite funny! He must be a bit stronger also - as Mr.C has been able to feel him since I was only 19 weeks through, and you can also 'see' him most of the time now when he is moving! It will be interesting to see his little personality grow once he arrives. What I cannot believe though, is how much quicker this whole pregnancy is going! I am only like four weeks off heading into my third and final trimester - I am so NOT ready for that, being a Mum of two just scares me!!!!! Never mind - thousands of women so this everyday and most survive, so I am sure I will be fine; just got to remember that it is just for a season! So there you go - pregnancy two a good way through now! I love the thoughts of the new personality before you even meet it's so special. similar - maybe fractionally bigger. And yes, every baby is so different, even in utero. Hmm, interesting. You were definitely bigger looking early on this time round, but do look about the same now (and I had thought that when we saw you recently, not just looking at the photos now). Glad that it is going so well for you. Got a little gift for Al (a nickname from his proposed initials?!) today. Nope, I am SO not telling you what it is, except that it is cute and you will all love it. Grin.